If you were kid who started gaming back in the early 2000s, you probably didn’t find yourself in dire need of a dedicated gaming mouse with fancy features and amazing sci-fi like lighting, you were probably too satisfied with your roller ball mouse which was heavy, very hefty in feel but hey, you were still a good player in your quake matches or mowing down people in StarCraft one with sheer force. Around the year 2004, Razer took the gaming hardware by the storm, we had far more gameplay defining games, the e-sports category was in its prime, and the gamers needed more out of their systems and their accessories, thus the Diamondback was born in an era where the concept of gaming mouse was not seen before. After its disappearance back in 2007, Razer finally decided to revamp the mouse to give homage to its roots, 2015 saw the return of the Diamondback, and well, it is not as glorious as we thought it would be. During my first hands on experience, the very first thing that my attention went to, was the very shape of the mouse, Diamondback has the most unique and peculiar design ever, it is a shame that its design is probably the only thing that would make gamers turn it down. Most mice are either claw-grip or palm-grip, but Diamondback here wobbles somewhere between those two, and does a bad job at that too. The mouse is skinny and long, and my small hands struggle to get any sort of valid, comfortable grip and I am left with having to grab the mouse in a weird hybrid between claw and palm grip. Your first couple of hours with Diamondback are not going to be the most fun time you have ever had, but after a while, and with prolonged use, you would manage to find that right spot on the mouse, you discover that the mouse is actually pretty light weight and is quite quick when moving side-to-side due to the smaller width. But even after my new discovery of the wonders of the mouse, it still was quite exhausting to play with awkward, and I was frequently getting hand cramps after every four or five hours of CS:GO or DOTA2. Playing different games with it, I noticed that Diamondback is not for every gamer out there, even though the grip of the mouse is somewhat difficult to play with, first person shooters like CS:GO or No man’s sky and strategy games, including MOBAs like StarCraft III and DOTA2, the former requires quick, twitch-like movements and the mouse is very responsive, helping you get your melee game on point. For the later, because of the mouse’s light weight, it was easy to skim around the map. 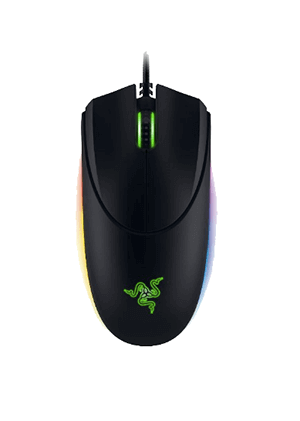 Technically speaking, the mouse does not offer the gamers any revolutionary features and offers the Razer’s standard seven button configuration (two buttons each on the either side of the mouse) a plastic body with matte finish, braided cables and that RGB lighting fueled Razer logo on its rear and the very common 16,000 DPI 5G sensor, which in most basic terms is a laser sensor with excellent acceleration feedback (a far bigger a number than its 2004 avatar, that sported a 1,600 DPI sensor), helping you take advantage of Diamondback’s weight. During my gameplay, I noticed that the scroll wheel is quite loud, not so much as being a distraction, but just enough to be an annoyance. The few recent Razer products the mouse is a member of the Chroma line, giving it absolutely stunning backlighting with possible 16.8 million colours, which can be changed and customized by using the Synapse software, giving you the ability to allocate a different colour for each game and for different sensitivity profiles. All in all, the mouse is okay if it was in the mid-range price category, but quite surprisingly, The Diamondback is in the high-end price category, now, I probably wouldn’t pay that sort of money for any gaming mouse, but especially not for one that can handle only a few game genre and offers a grip form that is out of this world and for a different species of lifeform. Users of the old model would find themselves at home while purchasing the new Diamondback, but newcomers would find themselves struggling with the mouse.